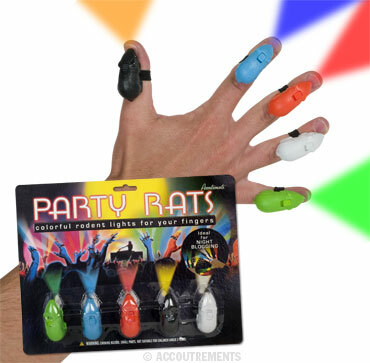 I think it goes without saying that the singular thing that has been missing from raver action for the past several decades is the inclusion of more rodentia. Sure, you’ve always had that strange kid with the serious buck teeth X’ed out of his gourd and gnawing on the side of a table, but that’s just not the same. What has been missing is some Party Rats. Just look at these little bastards. Who wouldn’t want them? It didn’t take a kilo of MDMA for me to figure out that these were the real deal: a vision of the future. I’m just happy that Archee McPhee has had the foresight to provide us an outlet to obtain such enlightenment. Who knows, maybe they’ll even help quell alien invasion. Hell, they are even ideal for night blogging: it says so right on the package!